Given the condition of our roads and drainage system, heavy downpours create flood-like situations on roads. Nearly all of us must have had to drive through waterlogged areas at some point in time. But take it from us, water and your vehicle can never be friends. In fact, water is your vehicle’s worst enemy, in ways you can’t even imagine. We had earlier featured some videos, which show vehicles damaged by flooding. Today, we bring you two videos that show how dangerous it is to drive though deep waters. Both the videos are of the same car (Mahindra XUV500) but shot at different times. In the videos, we see that the whole area through which the vehicle is driving is waterlogged, or simply put, flooded. The Mahindra XUV500 driver though seems to be wise and maneuvers his car in a good way through the water. Using kerbs and people as a reference point, one can guess that the water level is easily 3-4 feet high at many points. Curious eyes would also notice warning signs randomly popping up on the infotainment screen. That’s actually because of the water playing games with the electronics systems. Further into the videos, a tractor and a truck pass the car from the opposite direction in each video respectively. Both created huge splash waves which were high enough to reach the bonnet of the vehicle, with water climbing to windshield level. The driver was fortunate enough to not have stalled the car which could have led to adverse results. Now, If you think that owning a big SUV translates into having your way with water, you are utterly wrong. While it’s true that SUVs like the Mahindra XUV500 are better suited to deal with such situations, but remember, they are cars not submarines. One should avoid driving during such situations until extremely necessary. There are many pitfalls which you might not be even aware of when one drives through high water levels. Ask any owner who drove in such conditions and he’ll testify that the car was never the same again. Here are some of the potential dangers you can face, and tips you can follow, if you are caught in such conditions. This is one of the first hits your car will take when navigating through high water levels. 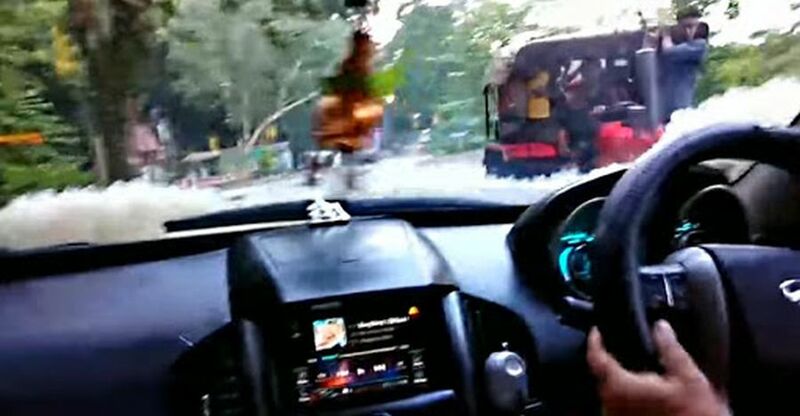 As shown in the video, the infotainment starts to behave in a funny manner when the car is in water. Sensors and electronics take a big hit and could result in short circuits or even fire if not tended to properly afterwards. Hydrostatic lock or simply hydrolock is a condition in which your engine stalls and won’t start when cranked. This happens when water enters the cylinder head therefore affecting the compressibility ratio of the cylinder. Hydrolocking can cause permanent engine damage to your car (fractured crank, bent connecting rods etc). One good way to avoid such conditions is to make sure that the water level is below the air intake section. If not, don’t drive through or you may have to face serious repercussions. Water can seep in through the exhaust also. Constant running of engine keeps water entering the exhaust at bay because of the pressure with which the gases come out of the exhaust pipe. But, if the engine stops midway or if it stalls due to some reason, water can be sucked in. If you do have to drive through a waterlogged road, make sure you make it gentle. Entering the water at around 5 kmph and then slowly increasing the speed till 10-15 kmph is the key. By riding slowly, you create a bow wave in front of you, which forms a depression in the water, keeping water out of the engine bay. Also, keep your engine running at all costs. The moment your car stalls, consider yourself to be done for long. For the same reason that requires you to drive slowly (bow waves), you should also stay as far back as possible from a heavy vehicle, such as a bus or a truck. Always avoid getting in range of other vehicles’ waves as these waves rise higher than the actual water level and may damage you engine. Therefore, avoid taking a flooded road with a heavy vehicle driving ahead of you, or next to you, or opposite you. Discipline is the key and one vehicle passing through a flooded stretch at a time is ideal.